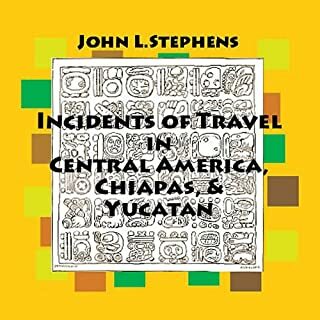 These are the true life tales of adventure and travel throughout Central America by John L. Stephens who employed Frederick Catherwood to create artistic renderings of their discoveries. First published in 1858, the world was amazed and intrigued by their travels. I bought this title because I visited several Maya sites on an archaeological tour and am very interested in what Stephens and Catherwood saw and thought. The first volume, set in Guatemala beginning in 1839, has very little of this to offer. It mainly focuses on Stephens' travels in Guatemala and only describes one archaeological site. Catherwood is a minor character. The reading begins agonizingly badly, with phrasing nonexistent. It improves somewhat as the book continues, but the editing is poor. There are spots where the reader notes he'll try that again (and repeats), for example. As many have noted, the website provided for Catherwood's illustrations is currently "under construction". Hopefully the future volumes will offer more that is of archaeological interest. Professor Timothy R. Pauketat illuminates the riveting discovery of the largest pre-Columbian city on U.S. soil. 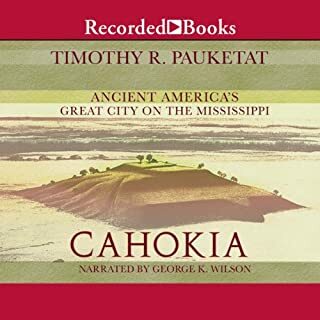 Once a flourishing metropolis of 20,000 people in 1050, Cahokia had rotted away by 1400. Its earthen mounds near modern-day St. Louis reveal “woodhenges” and evidence of large-scale human sacrifice. Slow starting, but once you get beyond the introductory chapters that basically are a rehash, newer archaeological evidence (very late 20th century) is included about this site plus a guess at Cahokia's longer term influence. This is one of the rare audible books where I suffered through the reading. It was plodding and based on its phrasing, sounded like the author was not familiar with the contents in advance. If the hard copy contains illustrations and maps, definitely that would be the way to go on this one. "'Boy, do I have a lot to learn!'" Anyone who's ever picked up a musical instrument of any kind - from the first caveman banging rocks to that little kid at the guitar shop - has thought that. I know I did. I'd been trying for years to break in to the music scene, to show everyone my chops, to make my mark. And I was good. But I wasn't great. I knew that there was something wrong. Then the teacher showed up...."
I listened for a couple of hours and couldn't take any more. My assessment is that it was written for people about mental age 12. I know a fair number of people serious about music, of various ages. I can't imagine any of them identifying with this. Obviously written by and for the immature. I hope by the end he grew up, but frankly I don't care to follow his journey any farther. An amateur production of The Tempest provides a colorful backdrop for a hilarious look at unrequited love. Mathematics teacher Hector Mackilwraith, stirred and troubled by Shakespeare's play, falls in love with the beautiful Griselda Webster. When Griselda shows she has plans of her own, Hector despairs on the play's opening night. 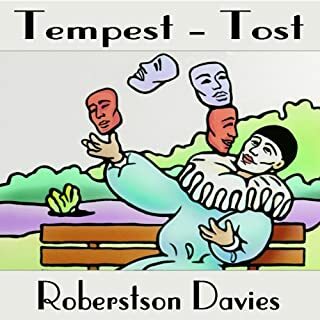 As the first book in Davies' first trilogy, Tempest-Tost sets the stage for what is to come in Salterton, then elsewhere in his world. I have read all of his novels "in paper", and he is one of my favorite authors. By now I have experienced several in audio. His books were meant to be read aloud, as you would expect of a former actor. 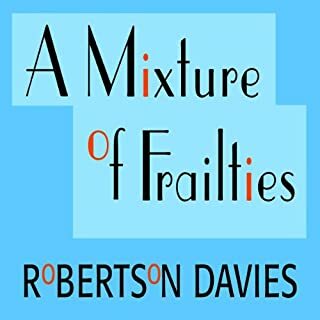 In all of the novels Davies depicts multiple human beings as lively, sympathetic creatures who are trying to get on with life --- though to our delight, they do not generally know what that means. The drawing is less skilled here than in his later works, though he tells an amusing story. Anyone who has been around amateur theatricals will enjoy the background. Tempest-Tost also introduces us to characters who will come to fuller life in the other parts of the trilogy. Anyone who wants to spend an entire novel "inside" one person should know upfront that Davies may not be their man. To some extent in this work, and much more in later ones, he gives life and depth to multiple characters --- with a wonderful combination of humor, tragedy, and sympathy. The humanist peeks through here, as does the humorist. But they have yet to become one. The main object of both the humor and the sympathy here, a sad pedant, is too one-dimensional. To me the book lacks the depth, grace and balance of the later ones. It is a worthy effort. If heard in sequence, you can see how rapidly Davies moved from talented beginner to far more. If you are trying to pick a book that will help you decide whether or not to read more of Davies, this would not be the best first choice. But if you want a complete picture of his Salterton community it will be well worth your time. 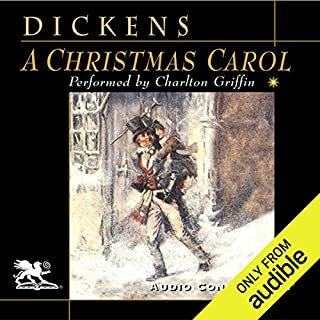 The spirit of Christmas has never been captured better than by Charles Dickens' masterpiece about Scrooge, Tiny Tim, Bob Cratchit and all those wonderful spirits, especially the ghost of Jacob Marley. It can be fairly stated that Dickens was so successful with A Christmas Carol, that his characters have become more well known than the title itself. I purchased this as my "seasonal cheer". While the story focuses on Christmas, its message is for the whole year. Just a few days after buying this version, audible.com gave me a copy of the Tim Curry version. I have listened to both, and of the two I prefer this one. Both are decently read. To me the Curry version reminds me of a grandfather sharing it with a child just learning to read --- slow and deliberate like he's letting the child point out words on the page as they go. To my taste, this version is narrated more smoothly, and the reader is more intent on communicating the story. Most of us probably already know the story or at least a version of it. So the delivery is what counts. Different people will have different preferences. The plot may not suit people who feel "Scrooge-like" at this season, but for others, it is heartwarming. Given how long ago Dickens wrote A Christmas Carol, it is amazing how little of it seems dated. Its style is more leisurely and observant than it would be if written today. But the author's observations and asides rarely feel intrusive or dated. 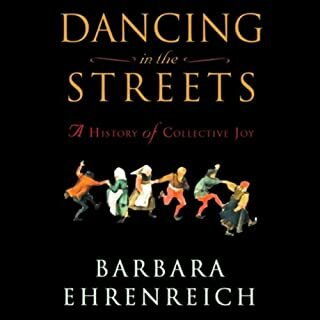 From best-selling social commentator and cultural historian Barbara Ehrenreich comes this fascinating exploration of one of humanity's oldest traditions: the celebration of communal joy, historically expressed in ecstatic revels of feasting, costuming, and dancing. Ehrenreich uncovers the origins of communal celebration in human biology and culture, showing that such mass festivities have been indigenous to the West since the ancient Greeks. I tried to listen, but gave up. This reminded me of my worst courses in grad school, required ones given by professors who stood woodenly in front of the class and read their magnum opus to us in a monotone. And, like the worst of them, it contained no revelations before I was mentally asleep. A Mixture of Frailties is so much more than the story of Monica Gall's life in London and her education as a singer. It is an account of her education as a human being, and the result is an absorbing novel, comic in the true sense, vivid and frequently moving. I love Robertson Davies' books and have read them all. This is the second audiobook I've gotten. The first was Leaven of Malice. Because it is so comic and comparatively simpler, I had expected that to be more suitable for an audio version, and it was excellent. But this is even better. As with all Davies, many of the characters are extremes, but all are vibrantly human, even the nastiest. The deep humanity of the author who was an actor, editor, professor, dean AND writer shines through. The plot starts with a nasty joke of a will that leaves the son and daughter-in-law of a formidable and brilliantly vindictive woman with a hundred dollars, a huge house to maintain, and nothing else. However, they will inherit everything when, and only when, they produce a male heir. Meanwhile, the income from her (for the time) huge estate is to help a Canadian woman study "the arts" abroad. We are shown both the hardships imposed on the young couple left in Salterton and the unexpected good fortune of the young woman chosen to benefit from the legacy. 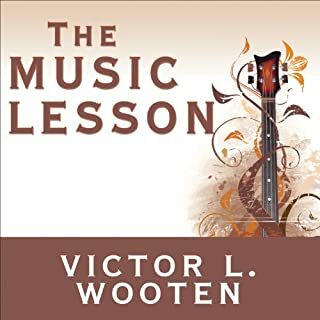 The characters include an "old puss", a churchman, the young couple, the young female singer being trained, a famous conductor, a gifted composer, and numerous others. The main emphasis is on watching the development of the young singer. We also watch the son develop some backbone and a sense of humor. The incidents combine warm sympathy for the characters, a great sense of the absurd, and a mixture of joy and loss. Since this is not a tragedy, it ends well for the main characters. The reader is excellent. The writing is excellent. The characters and incidents are enjoyable. Who could ask for anything more? 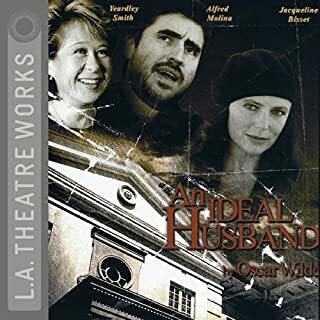 A tender love story, a serpentine villainess, a glittering setting in London society, and a showering of Wildean witticism are only a few of the reasons why this play has enjoyed hugely successful revivals in London, in New York, and on the silver screen. This 1895 drama is eerily prescient, as it examines the plight of a promising politician, desperate to hide a secret in his past. With empathy and wit, Oscar Wilde explores the pitfalls of holding public figures to higher standards than the rest of us. Very well presented in this recording. The politician's problem is still an issue today (trying to hide something shady in his past, and being blackmailed by someone who knows about it). There is a lot of lighthearted and/or amusing speech throughout, and some minor characters exist mainly for laughs. Wilde puts the most seemingly frivolous major characters "in the right", both in their attitudes and their verbal cleverness. An Ideal Husband is not a sermon, though it has a serious subject behind it. This version definitely is more enjoyable because multiple players take part than it could be read on the page. Best of all would be to see it on the stage --- but this is a very worthy second-best. 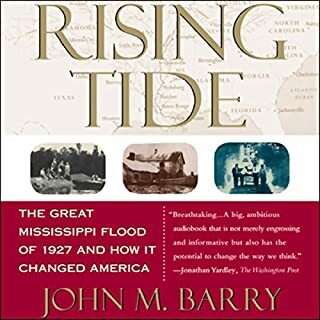 An American epic of science, politics, race, honor, high society, and the Mississippi River, Rising Tide tells the riveting and nearly forgotten story of the greatest natural disaster this country has ever known, the Mississippi flood of 1927. The river inundated the homes of nearly one million people, helped elect Huey Long governor and made Herbert Hoover president, drove hundreds of thousands of blacks north, and transformed American society and politics forever. Where is the rest of the book? I ordered this title because I grew up near Greenville, MS, and was curious what a comparative "outsider" might say so long after the fact. I heard many tales of this flood, and the Percy family so key to this book was well known (believe a room in the local library was named for them among other items, and read Lanterns on the Levee in high school). The reader does a good job. A cautionary tale of scientific and engineering rivalry over flood control theory, and how it combined with having the absolutely wrong leader in place at a critical time. Those power struggles are timeless. As Katrina shows, they never DID get the flood control problems handled right. . .but the lessons go well beyond just the Mississippi River and who claims to control it. Not preachy, and not dry. Truly well done. 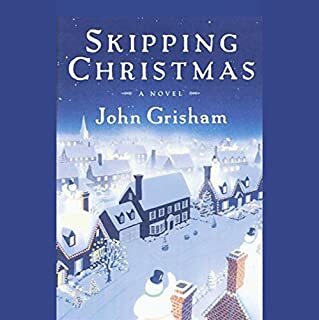 Best selling author John Grisham ( A Time to Kill, The Brethren) returns with a new tale for modern times, offering a hilarious look at the chaos and frenzy that have become a part of our holiday tradition. A lighthearted, superficial and mostly amusing look at what is considered a "typical" American Christmas, up to being set in a Midwestern suburb. Caricatures (not characters) in situations either pushing the crassest stereotypes of Christmas ("must do this"), or trying to dodge ALL of the holiday, including its original spirit. In the end, a fairy tale ending forces the would-be dodgers to fully embrace all of the crap. Don't know if this is what the author intended, but it left me feeling the best solution would be to give skipping Christmas a try --- only continuing the "giving" parts, not necessarily for "the day". Bah, humbug! It really shouldn't have to be "all or nothing".